With those four lines, Reddit’s 2017 April Fool’s Day experience was underway. The rules were simple: Each Reddit user could place a single colored pixel on a giant digital canvas every ten minutes. Unlike the April Fool’s Day experiments from previous years (which primarily involved mind games, digital hats, and random peer-to-peer conversations), this year’s prank was different in that it encouraged individuals to come together and produce something truly grand. Or, you know, the canvas could become a smattering of racist images, Swastikas, and genitalia. Because that tends to happen when people decide to ruin the fun for others. 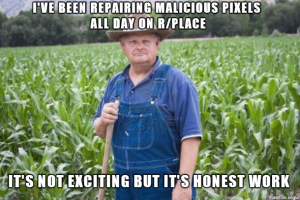 The experiment was called “Place,” and it existed in the /r/place subreddit. The subreddit itself had existed for over five years, but in a few short hours it would become home to one of the coolest examples of artistic cooperation in recent memory. 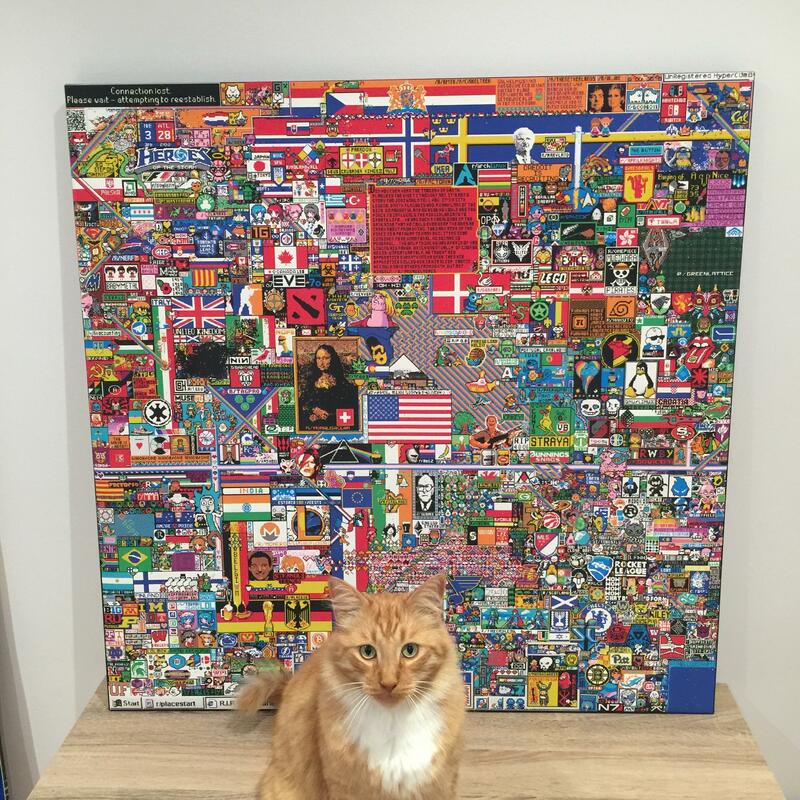 To begin, I think it would be useful to watch this video timelapse of /r/place that was taken over the course of 72 hours. You can get a rough sense of the beginning of the canvas, the factions that soon developed, the conflicts that arose as space became tight, the “black void” taking over other artwork as users spread black pixels, and so on. Plus, it’s scored by Hans Zimmer. You can’t go wrong with Hans Zimmer. Once the rules were announced by Reddit moderators, the experiment was underway. 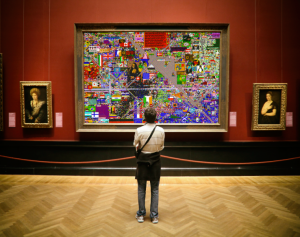 Individualism gave way to tribalism as early visitors to /r/place began to see the potential in the digital canvas for individual expression and crowdfunded images. Factions began to form around various “plans” that people shared on the /r/place subreddit, and these ideas formed the backbone for how the canvas would eventually look. The biggest obstacle was the 10-minute limit and the fact that users could only place a single pixel at a time. You could have the greatest idea for a project, like Starry Night or the Mona Lisa (both of which would be created by the public), but there was absolutely no way a single user could make any substantial progress at a rate of six pixels every hour. The ten-minute timer was eventually reduced to five minutes (after a user made a bet with an admin that the cooldown would be changed to 5 min. if the user’s request received over 10,000 upvotes from the public), but the delay was still too long to do anything productive without collaboration and a true hive mentality. “The blue corner” began with a single blue dot in the bottom-right corner, and it became a short-lived movement to cover the entire canvas in a sea of blue. Within hours, they had accomplished a great deal; however, members of the newly created “blue corner” subreddit decided to enforce a rule that they would never paint over other users’ pixel artworks. Their blue expansion virtually ceased (since the canvas was already packed with other works), and artwork began to be placed all over the sea of blue. While the bottom-right portion of the canvas descended into an artistic free-for-all, the predominant background for this region stayed blue and a few noble users made it their primary mission to make sure that the single bottom-right pixel stayed blue as well. Here is a fascinating timelapse of the rise and fall of the blue corner. Note that this takes place over 72 hours. Similarly, “The Rainbow Road” began as a vast swath of diagonal colors arranged in a rainbow pattern in the middle of the canvas, moving from top-left to bottom-right. The core of the rainbow soon expanded in all directions, bouncing off other users’ artworks and continuing to expand until the canvas was basically full. 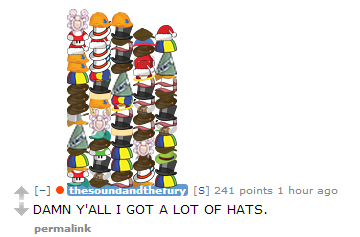 /r/ainbowroad was created (yes, they cleverly skipped the first r), and members began to build relationships with other “Place”-specific subreddits as well as preexisting subreddits that sought to create pixel art on (or near) the Rainbow Road’s territory. 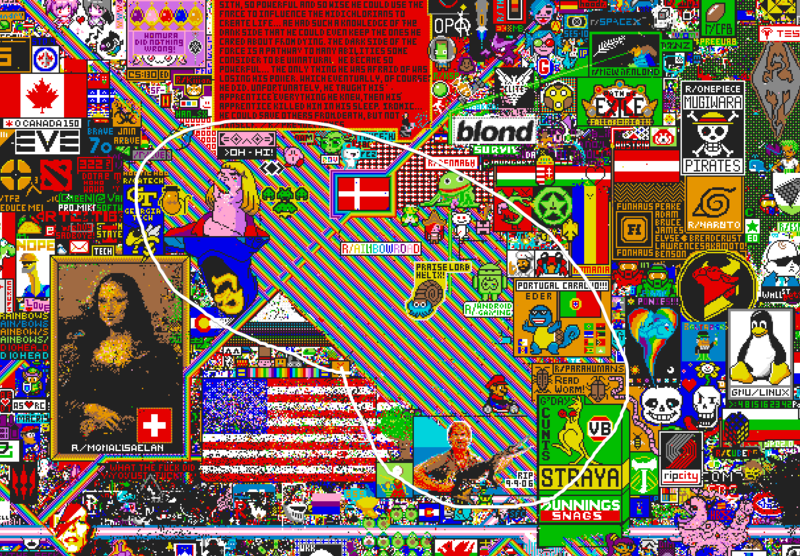 A memorial to The Crocodile Hunter popped up towards the bottom of the central rainbow in collaboration with the Aussie subreddits. Areas where the Rainbow Road expanded into other artworks were modified to allow the road to pass under and through users’ creations in creative ways (through mouths, through “rips” in the canvas, around picture frames, and so on). The Rainbow Road ended up becoming one of the key factions in /r/place. Pink Floyd’s Dark Side of the Moon album cover made a brief appearance, before it was ironically consumed by the void. Users painted the Mona Lisa, Starry Night, and other famous artworks (and some repeatedly tried to give the Mona Lisa large breasts). 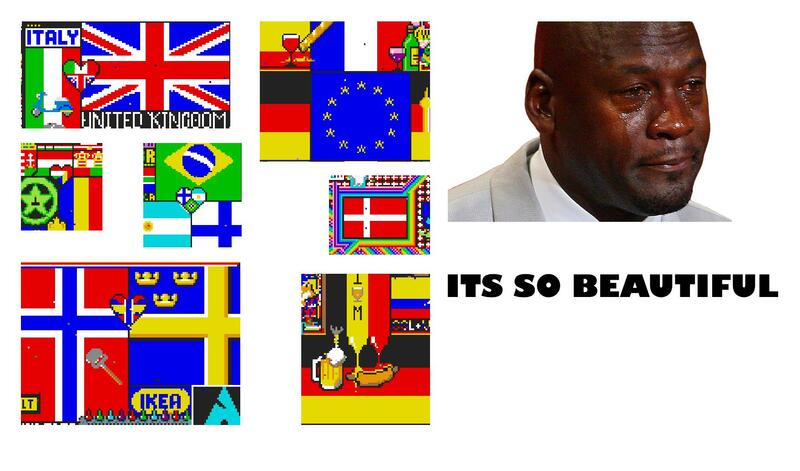 Country-specific subreddits placed their national or local flags all over the canvas. Feuds were frequent, especially between Germany’s flag and France’s flag. Germany’s flag literally expanded into France’s territory and forced France to move farther north on the canvas. I can’t make this stuff up. 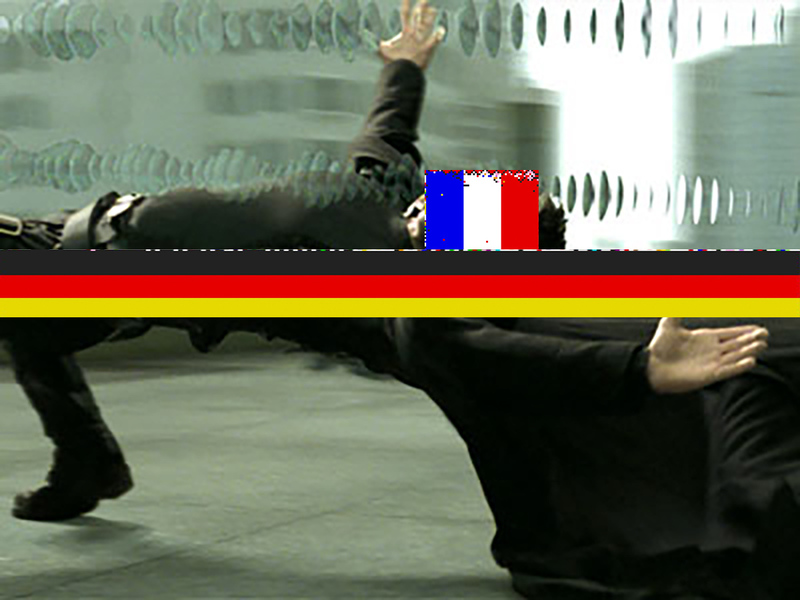 Memes were created solely for the purpose of poking fun at the reignited German/French rivalry, like this Matrix reference. Video game references were everywhere, and 8-bit recreations of classic characters were spread across the canvas. Link, Starfox, Mario (who evolved into Wario as users changed his colors), League of Legends, Overwatch…almost every major game was represented. There is a subreddit that revolves around Star Wars prequel memes, and their users created one of my favorite parts of the canvas: an entire movie quote about “Darth Plagueis the Wise” that takes up 18 lines of legible text. While many attempted to alter the words with their pixels, valiant efforts from /r/PrequelMemes users kept the quote intact during the duration of the experiment. Eventually, phrases like “Rainbow Road,” “Green Lattice,” and “Blue Corner” became ubiquitous as memes were born out of thin air. 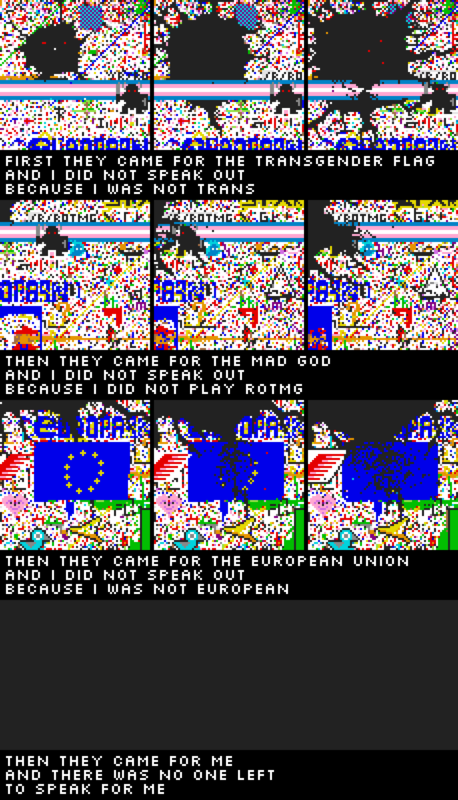 Redditors who used their pixels to destroy or negatively alter preexisting artwork were called “vandals.” Users who got together and spread black pixels across the canvas were members of “the black void.” Some complained about the size of the canvas and wanted Reddit moderators to expand the four borders to allow more art to be created. 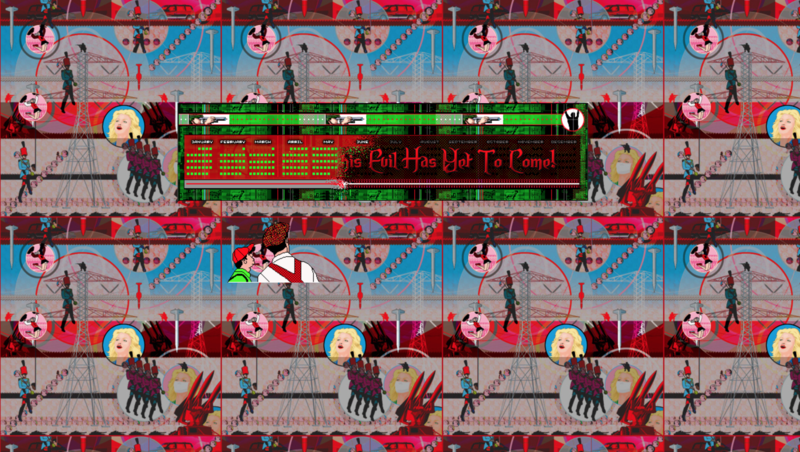 Others became aware of people using scripted bots that either created predefined images or placed random pixels all over the canvas, ruining the experiment for those who sought to have a fair experience. A few complained about the corporate advertising as Lego, IKEA, Mountain Dew, and other brand names became prominent on the canvas. I, personally, spent most of my time cleaning up two white dogs in the top-right corner. My girlfriend and I periodically signed in and made sure that the dogs’ tongues were intact, their eyes hadn’t been removed, and to clean up random vandalism that may have disfigured their bodies or the text below them. Yes, I had a lot of free time that day. After about 72 hours, /r/place ended and further edits were blocked. There was no warning or countdown, so users couldn’t make one final push for corrections, extensive vandalism, etc. The canvas was finished: mistakes and all. To summarize what the final product looked like, here are a few links. 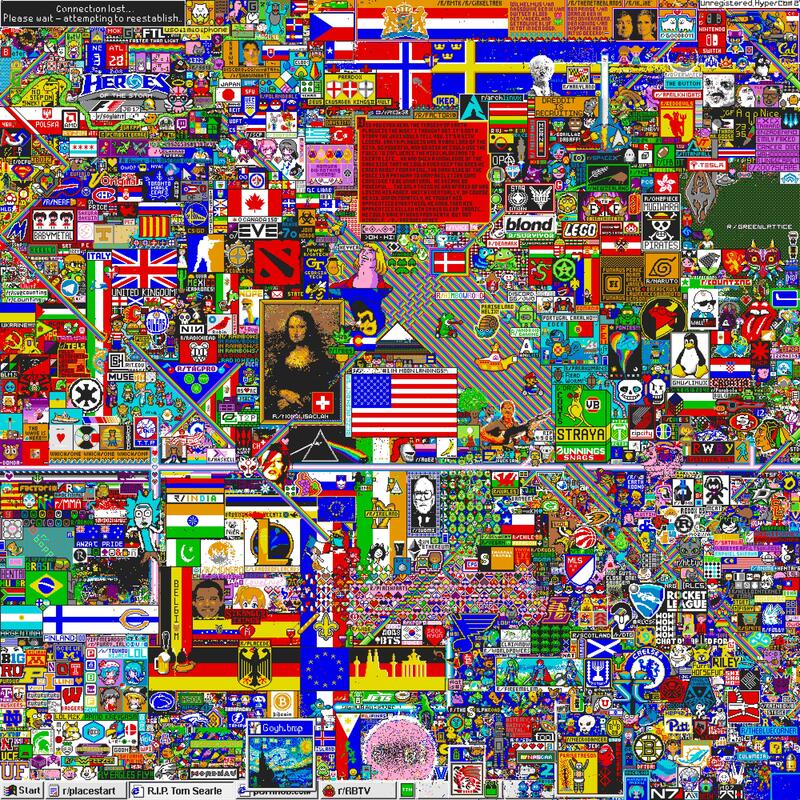 Here is a heat map timelapse that shows how the pixels were spread from the start, and it also shows areas where users concentrated their attention as the canvas became more about maintaining than creating. Here’s a video of the entire board changing over time, at 1080p and 90fps. I personally feel that this is best way to take in the entire experience after the fact. This is the /r/place atlas, an interactive map showing the most important sections of the canvas with brief descriptions explaining the creators, the intent behind certain images, the destruction that went on, and so on. It’s my favorite “historical” visualization of what took place, and it’s still a work-in-progress. 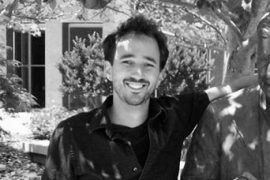 Following the removal of the edit feature, users began to analyze the impact that this April Fool’s Day had from an artistic as well as cultural point-of-view. Members of the /r/ainbowroad subreddit formed plans to make t-shirts available for purchase that showed off their multicolored contribution to /r/place, and other users started creating mousepads, mugs, and physical prints that included the finished canvas. Some attempted to con Google’s analytic systems by spamming the finished canvas’ threads with the word “art” so that the canvas would become one of the first Google Image results when people searched for art online. The media began to pick up on the story and attempted to draw grand conclusions about the power of anonymous cooperation. 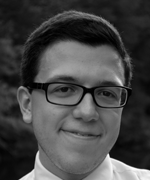 For example, Ars Technica published an article titled, “Did Reddit’s April Fool’s gag solve the issue of online hate speech?” The author specifically addresses the absence of hate speech and sexual iconography on the canvas, suggesting that the work and time needed to maintain negative pixel images was enough to dissuade users from attempting to spread them (especially when there were thousands of users actively working against negative trends). Reddit user /u/_Eltanin_ perfectly summarized what I was going to attempt to explain in the conclusion for this column. I have included his comment in full below. 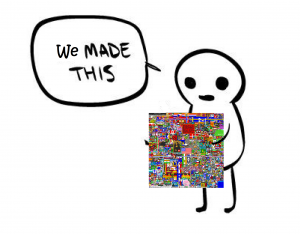 /r/place was an amazing cultural snapshot of the internet in 2017 that is the perfect example of what the word ‘meme’ means in BOTH its definitions! an element of a culture or system of behavior passed from one individual to another by imitation or other non-genetic means. What started off as a blank canvas with vague instructions and the ability to put down a single colored tile per user for every 5 minutes shortly but surely became a community-driven labor of love that spawned territorial control and aggression, coordinated efforts to build, attack, defend and rebuild, debates over real estate allocation, diplomatic talks and alliances, faction sanctioned protection and other various activities that you’d least expect to come from a random social experiment whose main goal was simply to draw things on a canvas. This has seriously been one of the most interesting and fun things the internet has done as a collective to which I am extremely glad to have experienced and have been a part of.